Thomas Newkirk: Hey Alfie, what are your thoughts on writing another book for Heinemann? Alfie Kohn: Hmm, I don’t know. I’m kind of busy with public speaking and posting my one tweet per day. Newkirk: Yeah, I hear you. However, I have this idea where we would just reprint some of your more salient posts from your blog and your articles for Education Week. Kohn: Really? You can book your blog? I’m kidding! This jest highlights my one beef with this book, in that there is no new material included in the text. Kohn didn’t even write an introduction for his most recent offering. However, if anyone’s previous work deserves a reprint, it would be Alfie Kohn’s. He has been the voice of reason for years, combating the negative influences of standardized tests, grades used as carrots and sticks, and classroom motivation tactics. With the current climate in education, Kohn’s book could not have been published at a better time. Instead of a Reader’s Digest version of this book, I’d like to highlight five of the articles I found that most impacted me as an elementary principal in a high-poverty public school. This article should be required reading for any school or district committee revisiting their grading system. 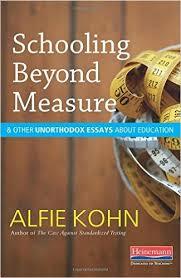 Kohn moves beyond the argument between A’s and B’s vs. standards-based grading, and highlights the problems with the system itself. Specifically, he finds that grades lower motivation for authentic tasks, creates a competitive learning culture, and misrepresents student success when teachers try to quantify achievement that should not be reduced to a number or letter. Thinking is messy; deep thinking is really messy. Therefore beware prescriptive standards and outcomes that are too specific and orderly. The more that students are led to focus on how well they’re doing in school, the less engaged they’ll tend to be with what they’re doing in school. In this article, Kohn takes on the term “grit” and how it has been conflated with other concepts such as “resilience” and “engagement” in educational circles. Despite the research presented by Angela Duckworth and other proponents of grit in schools, the writer finds the results unconvincing. Kohn questions the benefits of delayed gratification, noting that sometimes taking advantage of an opportunity available immediately is the better decision. Also, the author wonders if the researchers took into account the home factors that may impact a young person’s ability to defer something rewarding for later. Children should have plenty of opportunities for play. Even young children have too few such opportunities these days, particularly in school settings. Kohn goes on to support his argument by debunking multiple myths about play, evoking statements such as “Younger and older children should have a chance to play together.” and “The point of play is that it has no point.” The second statement really seems to run counter to how schools operate today, even though it shouldn’t. Kohn’s rationale rests on both current research as well as classic positions by John Dewey and other pioneers of public education. This article was perfectly positioned to end this anthology. Kohn provides a more positive outlook on the future of public education. He encourages educators to ask reflective questions about their own practice, take responsibility on behalf of the best interests of their classroom, and give ownership of the learning to their students. Kohn’s recommendations rest heavily on what we know to be most effective for students. Thanks for sharing this. I’m not familiar with Kohn’s work though I can see from your post that I need to be. The content of quite a few of those articles is of interest to me and I think I would like to delve into his thoughts a little more. Previous Previous post: Can Mobile Technology Help Us Be More Mindful?